This CD was launched in UK at a July 2003 concert in London. 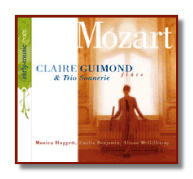 The Canadian flautist Claire Guimond's sweet, gentle baroque flute could not hold its own at Wigmore Hall, even against Sonnerie's gut-stringed instruments played with discretion. Her sensitive and expressive playing lacked colour and projection in the live concert situation. But all is well on CD, as I had anticipated. The flute has been favoured with a +10% or so lift and with a close microphone the special quality of the instrument is brought out better than in the concert. The moral is that it may take five to make a baroque quartet. The acute ears of a balance engineer are indispensible for recording or broadcasting, and a good pair of ears in the auditorium is advisable to assist preparation before a live concert. Long experience of working together in an ensemble may help, of course, but there are often problems with the delicate flute, and too with some fortpianos and harpsichords. The complete notes about the quartets and their history is available on the Early Music website. Recommendable for specialists, but others might have been happier with a mixed programme? With only 55'42" there was plenty of room to include something else to add textural variety.